The eyes and forehead work in unison to express a wide span of emotions ranging from excitement and delight to displeasure and exhaustion. In our youth, these expressions can be easily controlled, allowing us to exhibit exactly how we feel at any given moment. As we grow older, however, the natural aging process and its effect on our overall facial appearance can cause many individuals to look one way when, in actuality, they don’t feel that way at all. For instance, aging symptoms like sagging eyelid skin, bags beneath the eyes, and a drooping brow can create an irritated and/or worn out look, even when a person is quite happy and full of energy. Because the eyes and forehead are so closely linked, targeting both regions simultaneously can lead to a more comprehensive—and often better—aesthetic enhancement for many individuals. At 740 Park Plastic Surgery, Dr. Stafford R. Broumand and Dr. Daniel Y. Maman frequently perform blepharoplasty (eyelid surgery) and brow lift surgery in conjunction with one another for patients seeking to address cosmetic concerns in the upper third of the face. 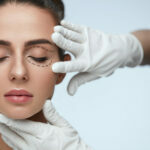 By combining these two facial rejuvenation methods, they are able to treat the vast majority, if not all, of the aging symptoms that typically manifest in the eye and forehead area, ultimately helping patients achieve a refreshed, more youthful appearance with natural-looking results. For more information about the benefits of performing blepharoplasty and brow lift surgery in combination, or if you would like to find out if you are a good candidate for this technique, please feel free to contact our practice today at 800-941-8459.